I used to be a road warrior. I traveled for my job, driving from small town to small town, eating fast food and staying in chain hotels. I always made sure to swipe all the usual hotel sundries – shampoo, soap, lotion. I did it because I was a cheapskate and those little bottles and bars made it so I had less to buy. I did it because it made me feel like I was really maximizing my dollars spent at the hotel. But over the past few years, I’ve come to realize that all those little tiny bottles of things are rather wasteful. Sure, I can get several hair washes out of them, but then there’s this little bottle to recycle and I can just imagine how much resources went in to producing it, let alone recycling it. I wondered about a more eco-friendly hotel stay. I started to refill those little bottles with the giant bottles from home, and in the process of not taking every little freebie at every hotel, significantly reduced some hard-to-organize clutter from my linen closet. I recently stayed at a small, locally owned hotel a couple of hours from home, and I was really impressed with their commitment to offering a more environmentally friendly stay. You see, they didn’t even offer those tiny bars of soap or little bottles of shampoo. 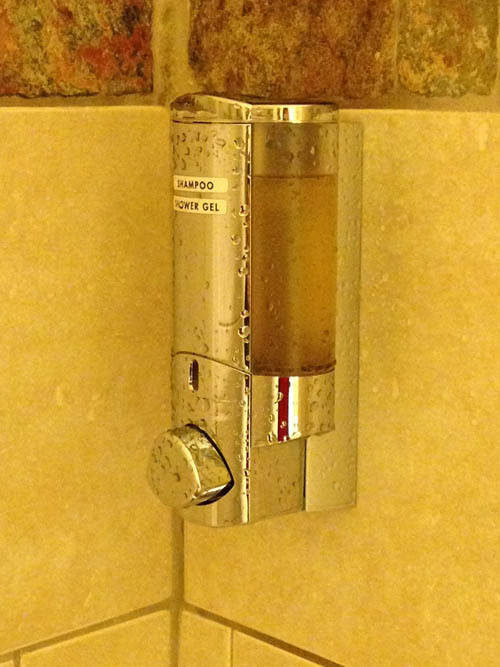 Instead they offered a all-purpose hair and body wash dispenser in the shower. 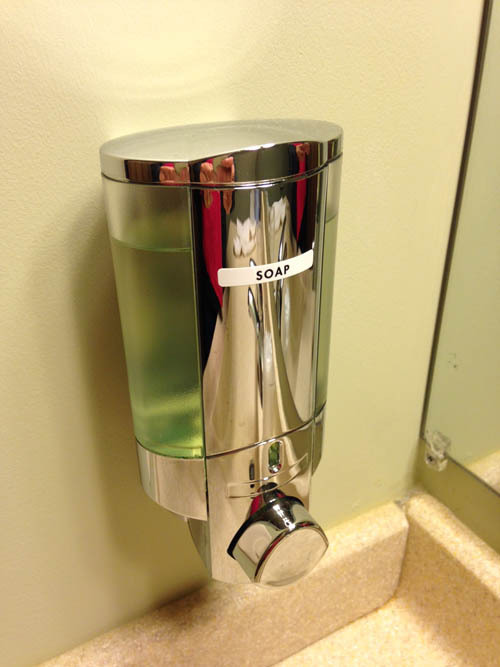 And a soap dispenser by the sink. The lights were all CFLs. There was no hair dryer, no coffee maker, and minimal outlets. Their cleaners? Vinegar, baking soda, water and Green seal-approved products. They encouraged you to use the same sheets and towels for multiple night stays. And they donated their old towels to a local women’s shelter. The place felt welcoming, and didn’t have a trace of that typical hotel smell. I was impressed by their efforts, and began to consider how so many of their decisions – done in the name of environmentalism – were actually good financial moves, too. Using homemade cleaners, energy-efficient lighting and washing machines, rain barrels and refillable containers are money-saving moves that we could easily do in our own homes, too. My short little stay at this eco-friendly hotel made me really thing about the places we typically stay when we travel. What if more hotel chains embraced the ideas this little mom-and-pop place has? And it made me think about what more I could do every day in my own home. Making the world a better place and saving money starts with the small things you do every day. It starts by thinking differently and committing yourself to positive change. I rarely travel, so this isn’t something I have a huge problem with. I also don’t use chemical cleaners at home. Like you just described, I use baking soda, vinegar, and Seventh generation dish soap. So when I walk into a place that reeks of cleansers, I find it severally off-putting. The average person doesn’t recognize how much perfumes are added to everything from dish soap to hair spray because they’ve built a tolerance to the scent. I think it’s awesome this place is not only saving themselves money, but helping the environment as well. Their lack of chemical cleansers alone would win my business! The Q Hotel and Spa is like that in Kansas City, as far as being a green hotel and all the same things you mentioned above. But my thriftiness also likes that they include breakfast and happy hour :) Plus they are SUPER nice. Although, as I was typing this I was looking up their website and saw they have been bought out and are in transition, they will still be eco-friendly it says, I wonder what differences there will be. Anyways, this is it http://www.achotelskansascity.com/new-ac-hotel if you ever find yourself in Kansas City. I have been there twice, both times for a Girls Weekend Away.